This munchkin is makeup obsessed! 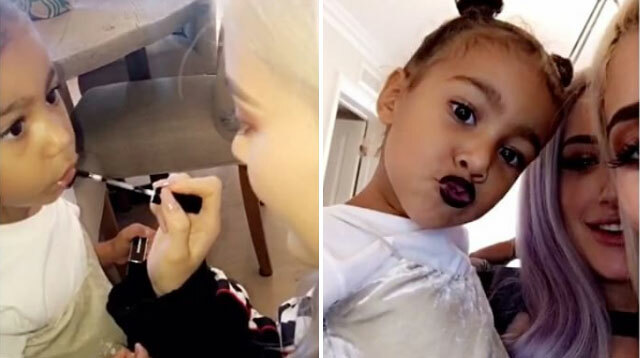 It was only a matter of time before little North West got her hands on one of Kylie Jenner’s coveted lip kits and it finally happened! During a birthday party for Tyga’s son King, North and her bestie Ryan Romulus got mini makeovers from Auntie Kylie and her BFF Stassi, and they both loved every minute of it. North let her bestie Ryan go first, while she watched in excitement for her turn. "They’re putting on my lip kits," Jenner said in her Snapchat video. Little Ryan went for a soft pink shade, while North went for a darker, more fall-appropriate shade. "Okay, you wanted black, ya? Aww, your little lips!" Kylie said while applying the shade "Dead of Knight" on North's puckers. After the two were Kylie-fied, North puckered up for the camera. Guess the apple doesn’t fall from from the tree—she’s clearly learned a thing or two from mommy Kim when it comes to taking a Snap! Finally, the two tiny tots posed with their lip looks, holding their lip colors, while Kylie snapped a final pic, captioning: "What happens at Auntie Kylie’s stays at Auntie Kylie’s." SO. CUTE. Side note: can we talk about these toddler's styles, because it’s way better than mine!